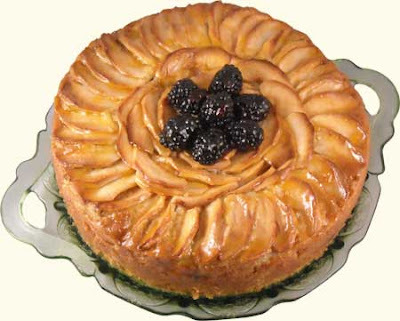 Discription:This is very tasty apple and blackberry cake.Try it and Enjoy!! Grease a 9-inch springform pan and line with waxed paper. Beat in eggs, one at a time, then sift in the flour. Stir in the diced apples and blackberries, setting aside a few blackberriesfor garnish. Pour in the batter (batter will be thick) and spread evenly in the pan. Arrange the apple slices around the top of the batter. Bake until lightly browned, or a skewer inserted into the center comes out clean, 45 to 50 minutes. Cool in the pan. Loosen around the edges of the cake; turn over and remove pan bottom and wax paper. Place cake top side up onto a serving plate. In a small saucepan over low heat, melt the jam and brush over the top of the cake. In a medium saucepan, bring the milk and cream to a boil over medium heat, then turn off the heat. In a medium bowl, whisk together the egg yolks and sugar until pale and fluffy. Slowly pour the milk and cream mixture into the egg mixture, whisking continuously. Return to saucepan over low heat and cook until custard is thick enough to coat the back of a wooden spoon, about 5 minutes. 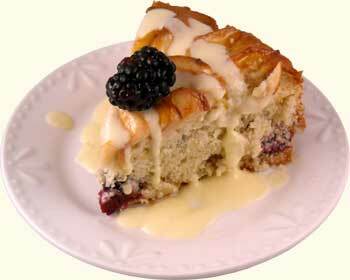 To serve, garnish with blackberries, slice the cake and spoon the custard over each slice.